Angela Kulig: Mike Mullin Guest Blogs "How to Get 100 Monkeys to Write Your Novel"
Mike Mullin Guest Blogs "How to Get 100 Monkeys to Write Your Novel"
Today on Angela WRITE Now, Mike Mullin is visiting. If you haven't heard of him, you--are rock dweller, and the rest of you know how I feel about those! Mike is a fab friend and a fab writer, read the deets bellow then comment on the AWESOMENESS. tried to chase him off ladders. So he’s really hoping this writing thing works out. Mike holds a black belt in Songahm Taekwondo. He lives in Indianapolis with his wife and her three cats. 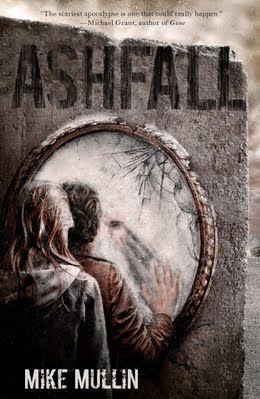 ASHFALL is his first novel. years, and it will erupt again, changing the Earth forever. and sister, who were visiting relatives 140 miles away. finds Darla. Together, they fight to achieve a nearly impossible goal: surviving the supervolcano. Buy beer. This is actually a generic step 1. Assembling a grill? Buy beer. Cooking a cake? You guessed it, buy beer. The type of beer matters. You want a classy brand, like Budweiser. It’s the King of Beers. There’s nothing classier than that. You’re not going to lure any monkeys to your writing cave with that Natural Light crap. Also, if this plan fails horribly, at least you have beer. Use beer to lure monkeys out of zoo. Bring extra for Zoo Security. poo off your walls, not fluffy white stuff off your driveway. Dig a basement. Or lure 100 gorillas away from the zoo to do it for you. out 10,000 words a day. What do you need monkeys for anyway? I love it! I need to get me some of those monkeys or at least some beer. Great post & I can't wait for Ashfall! OK, I purchase the beer, but now my husband is drinking it! Darn! I tried it. The monkeys spent all day every day on Facebook, when they weren't flinging poo. As usual, I had to do everything myself. With Angela holding a gun to my head. Lol. 100 monkeys? I would not want to shovel that poop. Amazing how inspirational nature can be. I can't wait to read it. This month's book budget is spent - will have to get it in September. Thanks for the laugh. Good luck with the book, Mike!